I made these layouts weeks ago while everybody was sound asleep and I was running out of creative juices creating for a client. You probably will agree with me that we are most creative at the wee hours of the night. This is made of scraps (except for the base paper). My friend, April sent me these papers including the stickers. I love how I was able to "weave" everything together - different papers from different manufacturers, the combination of two spray mists - espresso and coffee and the sticker owl on top. This is literally scraps because most are made from the scrapbook kit's packaging cover! I don't throw the cover especially if it's from Echo Park, there's just so much you could still cut and use. That's all for now. Christmas layouts will be out on the blog soon! Erin's school celebrates Father's Day every January of the year. This year Dad and Erin's team (the Red Team) happens to be the over all winner! Congrats to both of you. You did great both in cheerdancing and playing the games! I must admit girly layouts are always a challenge for me especially if the papers are like these. Although, I love the colors of this layout, I know there are still things I could've added. Perhaps, more flowers and more layers of papers? Anyway, this will do for now. I'm just to be sharing more creations lately. Love this picture of Erin, her dimples and curls are showing. We're missing her curls though because she had her haircut last April (for the very first time!). 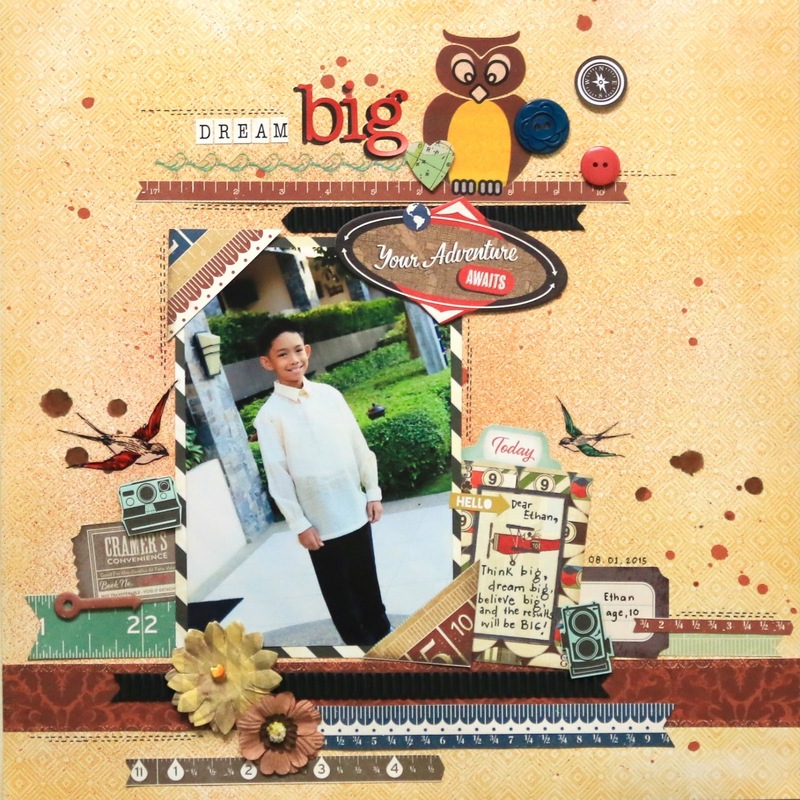 When I started scrapbooking years ago, I've always loved using "big" pictures. I've tried using 8"x12", 8"x11", 8"x10", 9"x12", 6"x8" and usually 5"x7"! I love big pictures because they focus more on the moments and my kids' faces which I really love to look at and be immortalized! I recently looked at Ethan's previous scrapbooks and realized how much I really want the big pictures rather than using the small ones. So, ok, for now, I'll be using my usual 5R photos. Maybe not for all of my layouts but most. Both layouts are made from really old and "retired" papers, to some "recent" ones. 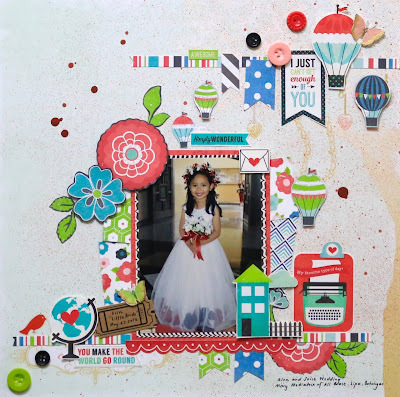 The first layout used Echo Park, Jillibean Soup papers, a Chatterbox journaling tag, a Fancy Pants felt embellishment, some Echo Park and Simple Stories stickers and more. For the 2nd layout, I used some Sassfras Lass (remember this collection? ), Echo Park, and Scenic Route papers. The journaling block is a PL card from Becky Higgins. Welcome to our blog! We're a photographer and a scrapbooker husband and wife team. Thus, the name, "Shoot and Scrap". Jeff is the professional photographer while I'm the photographer wanna be : ) Aside from event and real life photography, Jeff does graphic design and layout and marketing consultation for corporate clients. I, on the other hand, does traditional scrapbooking for clients who don't have the time to scrapbook. 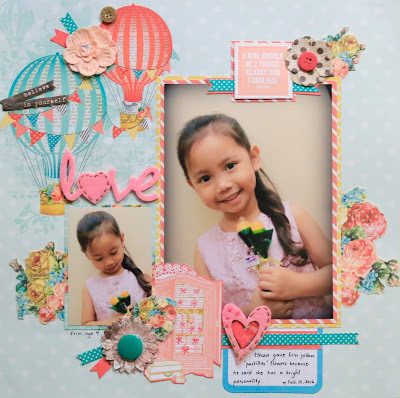 I also conduct scrapbook workshops and classes especially for beginners. Our blog is not just about the services we offer but also about our small and simple family life. It's about our works, our thoughts, things we love to do and all of the adventures and misadventures of our family! Thank You 2018... Welcome 2019!